We’d love your help. Let us know what’s wrong with this preview of Lunav by Jenn Polish. Brash, boyish sixteen-year-old Sadie thinks she can stop the worst from happening, but as a half-human, she l They don’t have dragons where half-faerie Sadie was born – not living ones, anyway – but in the Grove, everyone knows that dragon eggs grow on trees like leaves and need Dreams to hatch. Without faerie Dreams, the dragons won’t survive. And neither will anyone else. Evelyn might be the most beautiful girl Sadie’s ever seen, and Sadie might be betraying her family by falling in love with the ruthless leader who locks them up. But that’s not even the biggest obstacle between the two: Evelyn is leading the charge against Dreaming, and there’s something she doesn’t know. To ask other readers questions about Lunav, please sign up. 3.25 Stars. We all know never to judge a book by its cover. But NineStar Press has been putting out such beautiful covers lately, I could not help but be drawn to this book because of that. Of course realizing that this was a YA lesfic fantasy book just insured it would be a must read for me. I did like this read, I just didn’t love it like I was hoping too. Dragons, magic and the fae, this book really should have been perfect for me. For one, I thought this was going to be more of a high fantas 3.25 Stars. We all know never to judge a book by its cover. But NineStar Press has been putting out such beautiful covers lately, I could not help but be drawn to this book because of that. Of course realizing that this was a YA lesfic fantasy book just insured it would be a must read for me. I did like this read, I just didn’t love it like I was hoping too. Dragons, magic and the fae, this book really should have been perfect for me. For one, I thought this was going to be more of a high fantasy romance book. Instead this is more dark epic fantasy. (Epic fantasy meaning a large cast of characters and multiple books) I love epic fantasy don’t get me wrong, it is more the dark part that bothered me. And really thinking back, there are not many moments that are not dark, sad, or depressing. It was a bit too much for my tastes I need more moments of hope. This is more like it will be bad or it could be even worse. Secondly, I saw nowhere mentioned that this is just the first book in a series. I was surprised at the ending I did not see coming because of that. I was left feeling a little deflated at the end. This book is hard to get into at first. There are so many names, types of magical beings, and a whole new world to learn. It is a lot of info to take in at the beginning. It is not info-dumping, in fact there were things I wished where explained much better, it’s more that Polish lets you as a reader figure things out in your own time. This works, but not always, since I’m still confused about a few things. I do have to say this magical fae world is wonderfully imagined. I have never read anything quite like it which I always appreciate. I think the biggest issue I had with this book is it seemed like it had trouble deciding if it wanted to be YA or an adult book. The characters are supposed to be around 16, but almost never act their age. Secrets are discovered near the end that makes their young age seem even odder. Not to mention this is pretty dark for a YA book. I think if the main characters where in their early 20’s even just that small difference would have made the book work much better for me. There is a romance, but it is very light and quick since not a lot of happiness happens in this book. I give Polish credit for a brilliant imagination. She has dreamt up things I don’t think have ever been dreamt up before. I just really wish this book had some more good feels. I don’t know how long she plans on making this series. I am willing to give the next book a chance. I just hope I can put at least one smile on my face. This book was provided for free by Love Bytes in exchange for an honest review. This review was first posted to Love Bytes: LGBTQ Reviews. It has been slightly edited here for content. This book is a denser and more mature type of fairy tale than a lot of what we expect in YA fiction. It’s complex and political, and often, the teenage characters feel much older than they actually are. 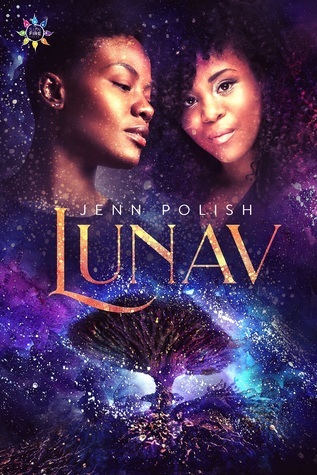 There are a lot of compelling and clever aspects to the world of Lunav, but it lacked the cohesion and character d This book was provided for free by Love Bytes in exchange for an honest review. This book is a denser and more mature type of fairy tale than a lot of what we expect in YA fiction. It’s complex and political, and often, the teenage characters feel much older than they actually are. There are a lot of compelling and clever aspects to the world of Lunav, but it lacked the cohesion and character depth that could’ve made it truly excellent. On a romance level, Sadie and Evelyn’s relationship is pretty much the definition of the “enemies to lovers” trope. In fact, halfway through the book, I wasn’t convinced that their tenuous bond could survive all the drama unfolding. But Evelyn really blossomed as a character in the latter half and I like how her motivations came to light as secrets were revealed. On the other hand, I never got a great hold on Sadie as a character. We know a lot about her—her family, her past, her anger towards the oppressive government. But despite these details, I felt like we never got to truly know her as a character, which prevented her romance with Evelyn from really clicking with me. I found myself more invested in the setting and worldbuilding than in the specific characters. Lunav is an original and unique world that we’ve never really seen before. This definitely isn’t a tired retread of fairy tale and fantasy tropes. I was instantly interested in the bonds between the fairy people, their trees, and their dragons—and how their culture was stripped from them. There are a lot of real-world parallels and the story is only enriched by the ways it mirrors our own society. There’s a glossary of worldbuilding terms included at the end of the book, but I’d take a look at it before you start reading. This story is dense with very particular language and phrasing that wasn’t always explained very well and left me puzzled long into the book. For example, the term “growns” is used for faeric parents, but until I learned that from the glossary, I thought it was a catch-all term for elders. Since these terms are used very often, I wish their meaning was made clearer through context so we could match them to terms we’re already familiar with. We have to be able to relate to fantasy to really enjoy it. There was a lot going on in Lunav. So much that I found it hard to engage at first. As I got deeper into the book the story pulled me in though. I DO wish there had been a bit more world building/history in the story though. We're thrown into a world in conflict, with a bunch of different races/species, dialects, magical abilities, pronouns, etc, and there's no explanation of anything. We learn different abilities as the story goes on and sometimes it makes you stop and go "wait, what?" For examp There was a lot going on in Lunav. So much that I found it hard to engage at first. As I got deeper into the book the story pulled me in though. I DO wish there had been a bit more world building/history in the story though. We're thrown into a world in conflict, with a bunch of different races/species, dialects, magical abilities, pronouns, etc, and there's no explanation of anything. We learn different abilities as the story goes on and sometimes it makes you stop and go "wait, what?" For example, there's a type of faerie that flies sideways somehow, and there's no real distinction of anything. This aside, I found the magical realm interesting. I also liked how the characters were defined as quer until they either chose or announced their pronouns, though there was nothing to show this in the story. It just was. Which was a bit confusing at times. I feel like there could be some way to integrate various explanations and history into the story without detracting too much. Sadie lives in a faerie world where each faerie is paired with a magical dragon as they grow. Humans fear and hate the faeries and dragons though and have enslaved them (somehow), blaming dragons for a plague that kills on contact. In order to suppress the faeries Humans perform an operation on them that prevents their dragon from developing and prevents the faeries from Dreaming. (Still not sure what Dreaming is.) Sadie is half-human so uses her ability to pass to spy on the Humans nearby. On one of her spying excursions she spies Evelyn, the new Commander for the Human army, and falls into instant crush. There is so much to love about Lunav. The worldbuilding that Polish manages is like a technicolor painting full of lush life and unique creatures which is absolutely what I want in a great fantasy novel. The fact that a queer romance is at the center and that there are so many non-binary characters, makes this a book to happily recommend to the teens in your life, especially if they identify as queer. It does take a bit to adjust to all of the terminology and the unique pronoun of “que” so the f There is so much to love about Lunav. The worldbuilding that Polish manages is like a technicolor painting full of lush life and unique creatures which is absolutely what I want in a great fantasy novel. The fact that a queer romance is at the center and that there are so many non-binary characters, makes this a book to happily recommend to the teens in your life, especially if they identify as queer. It does take a bit to adjust to all of the terminology and the unique pronoun of “que” so the first couple of chapters felt a bit clunky, but then the language began to flow much more smoothly. There is a glossary in the back of the book which was not apparent to me reading on my e-reader! It might have helped, but honestly most things were easy enough to pick up in context as the story developed. Be mindful that there is a dark tone to the book. The faeries, centaurs, and dragons are naturalists and vegetarians, living very close to the earth. They are ruled by a monarchy that clearly does not respect their traditions or beliefs. That is one of the central conflicts in the novel and sets up the star-crossed lovers trope. There are a few spots that I would say the violence becomes graphic but most of the battle scenes are conducted via magic spells that seek to neutralize the threat more than inflict harm. It is an ambitious world and would really benefit from being a longer novel to truly flesh out some of the details that feel significant but are rushed. For instance the differences between the type of faeries, or some of the woodland creatures that speak but only some characters seem to understand them. In fact, a prologue at the beginning would have gone a long way to helping clarify some of the previous events that become significant plot points. The story is told from Sadie’s perspective and while we learn many details about her life and physicality, she never feels completely realized to me. I feel both she, her romantic interest Evelyn, and the story itself really kicked into gear about halfway into the novel. And the final third is really well paced. If more of the novel was like the second half, this would get all the stars from me. Any book that makes me cry on the train deserves an auto 5 from now on from me. Just so you all know. So you already know about how I embarrassed myself publicly for this book and you must be wondering why. Well there are so many reasons. The world building here is rich, detailed, and superb. There's a wealth of magic, color, and injustice. I could feel the rage simmering beneath the pages. Lunav encapsulates the true potential of speculative fiction - to transport us to another world while still commenting on the conditions of our times. At the same time, the characters make you cry big ugly tears, smile from ear to ear, and laugh aloud. The writing is multi-dimensional, layered, and has amazing themes throughout. Enbies, dragons, magic, and lesbians? Yes, please! The (gorgeous) cover of LUNAV is another easy selling point, although between the fireflies, soothing colors, and back blurb, the book sells itself as more sword and sorcery fantasy (or even romance fantasy) than dark fantasy. And the book is dark. Not gory or gritty, but definitely dark. The first half of the book is dedicated to bringing the reader into the world and the atrocities taking place against the fae. Talking about downed trees as ‘b Enbies, dragons, magic, and lesbians? Yes, please! The (gorgeous) cover of LUNAV is another easy selling point, although between the fireflies, soothing colors, and back blurb, the book sells itself as more sword and sorcery fantasy (or even romance fantasy) than dark fantasy. And the book is dark. Not gory or gritty, but definitely dark. The first half of the book is dedicated to bringing the reader into the world and the atrocities taking place against the fae. Talking about downed trees as ‘bodies,’ loggers as butchers or murderers, and the general tension revolving around every slicing of a newborn makes for a very engrossing world, and keeps tension high. There was a slightly steep learning curve in the first chapter with the new words (a glossary is provided in the back of the book, which of course I forgot to look for until the last chapter), but after I got the hang of the dictionary I was solidly hooked. There was some redundancy early on, but it didn’t detract too much from the narrative. Lunav is a story about rebellion and tyranny that never eases up on how difficult it is to escape a system of repression. It gets dark pretty fast and then stays that way until the end. Generally speaking, I like darker books and more realistic stories. Mostly, I admired the author's commitment to not glossing over the hardships of oppression. However, there were a lot of times when I had to put the book down because it was so depressing. I'd suggest this story for people who don't want books th Lunav is a story about rebellion and tyranny that never eases up on how difficult it is to escape a system of repression. It gets dark pretty fast and then stays that way until the end. Generally speaking, I like darker books and more realistic stories. Mostly, I admired the author's commitment to not glossing over the hardships of oppression. However, there were a lot of times when I had to put the book down because it was so depressing. A great read from start to finish. It's definitely an emotional ride, but it's well worth it. Lesbian fairy tale for the win. I absolutely love it! It provides an enchanting and mesmerizing experience as you read it. I practically couldn't put the book down! And it is very well written in my opinion ! So gorgeous. One of my favorite things I've read in a long time. Lunav called my attention right away from the wonderful cover. If there is a small press that knows how to make them, this is Ninestar Press with Natasha Snow's amazing work. The story had a nice writing and I loved how refreshing and rich the worldbuilding was. I don't think I've ever read something like this before. And even though fae stories aren't typically my kind of thing, I quite enjoyed this one. But unfortunately, I would feel lost here and there. The huge cast of characters made the sto Lunav called my attention right away from the wonderful cover. If there is a small press that knows how to make them, this is Ninestar Press with Natasha Snow's amazing work. But unfortunately, I would feel lost here and there. The huge cast of characters made the story slow at times and I think I still don't know who all of these people are outside of Sadie's family. I also would have liked more explanation about the lands outside the world Sadie knows. Maybe if we had some of Evelyn's POV this would have been easily fixed. I also don't like how much the two women lied to each other and we just figure everything out in the end. It'd have been nice to let them get to know each other better through the book instead of focusing so much on disaster after disaster that kept happening. This was one unique book, that's for sure. Even by the end of the story I was confused but still liked it, but also had no clue how to rate it. But I'll do my best to sum up this book now. The main reason I read this book, and continued to read it even after being very confused by it, was the diversity. Because this book has everything, lesbian characters, non-binary characters, polyamours representations and I'm sure I'm forgetting more. It has it all and it's woven into the story so seamlessly This was one unique book, that's for sure. Even by the end of the story I was confused but still liked it, but also had no clue how to rate it. But I'll do my best to sum up this book now. The main reason I read this book, and continued to read it even after being very confused by it, was the diversity. Because this book has everything, lesbian characters, non-binary characters, polyamours representations and I'm sure I'm forgetting more. It has it all and it's woven into the story so seamlessly and enjoyably. A lot of stories these days seem to pick one identity or sexuality and just stick to the one in the story, and I'm not saying it's a bad thing, but I enjoyed having more and wish other books would do this as well. So I did like Lunav. I liked Sadie, and her family and her world. But I never found myself in love with anything, for one very simple problem. It's too much. We're introduced to a huge world with so many different parts, and a new language and family structures and so much more. And it's all so cool, but it's also confusing as heck. I got so lost every time I picked up the story again. It made it hard for me to invest in the story, and that made me sad more than anything. I think that if this book had been split into two that every part of it would have been better. The characters would have been deeper, because even though I liked Sadie I never understood her or really connected with her. The world would have been more explained and that would have been amazing because there are so many cool parts to it! But I digress. Jenn Polish is the author of two young adult books, Lunav and Lost Boy, Found Boy. Their debut novella, Lost Boy, Found Boy, is a scifi re-telling of Peter Pan in which Neverland is a holomatrix, Hook is a bisexual cyborg, and Tink is an asexual lesbian computer interface. Their debut novel, Lunav, a lesbian faerie tale, features dragons that grow on trees and friendship amongst rebellion. They te Jenn Polish is the author of two young adult books, Lunav and Lost Boy, Found Boy. Their debut novella, Lost Boy, Found Boy, is a scifi re-telling of Peter Pan in which Neverland is a holomatrix, Hook is a bisexual cyborg, and Tink is an asexual lesbian computer interface. Their debut novel, Lunav, a lesbian faerie tale, features dragons that grow on trees and friendship amongst rebellion. They teach Theater and English in the CUNY system, where they are also a doctoral candidate in English. They live in New York with their fiancée and their fantasies of having multiple puppies. Their website is jpolish.com.